It’s the first singles luge medal ever for a US slider. KRASNAYA POLYANA, Russia — Finally, Olympic gold for Germany’s Natalie Geisenberger. Finally, Olympic anything for Erin Hamlin and the United States. 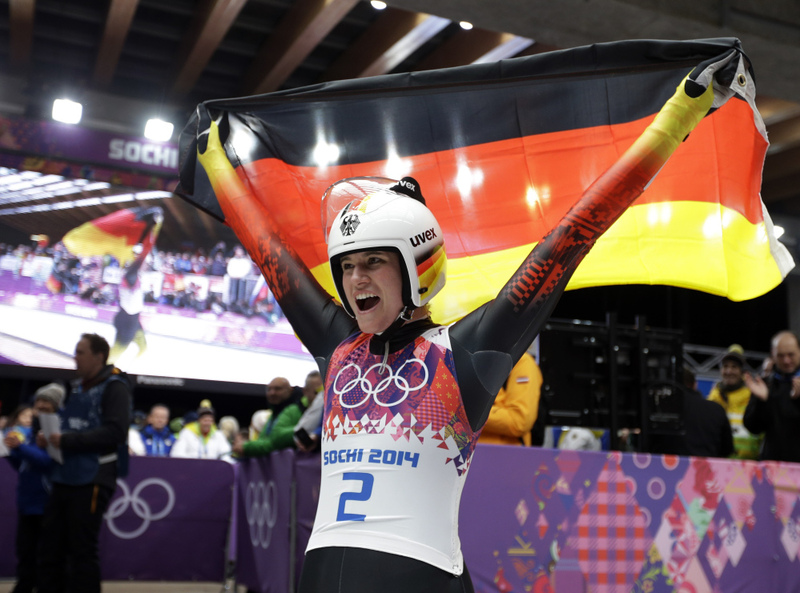 Leaving no doubt that she absolutely rules her sport, Geisenberger won the women’s luge gold medal at the Sochi Games on Tuesday — posting the second-largest victory margin in Olympic history. Her final time was 3 minutes, 19.768 seconds, 1.139 seconds better than German teammate Tatjana Huefner, the 2010 gold medalist. And Hamlin finished third, grabbing the first medal for any American singles luge athlete at the Olympics, 50 years after luge first appeared at the games. 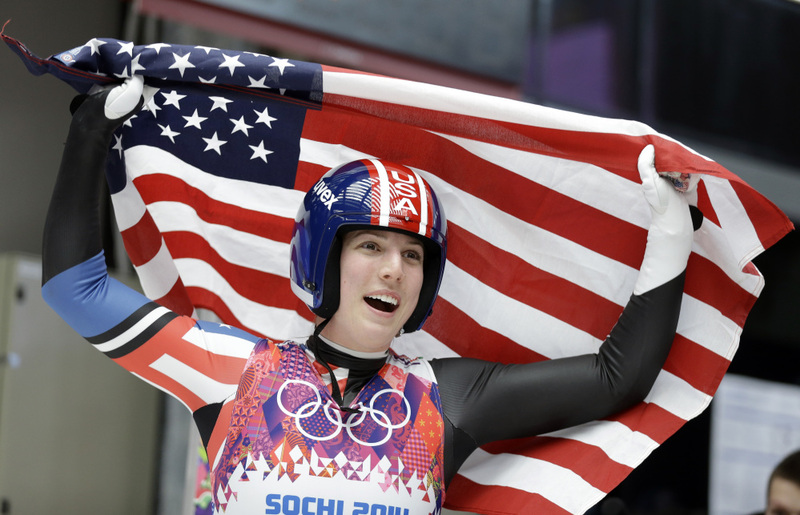 So in the sport’s golden anniversary as part of the Olympics, Hamlin came up with bronze, a feat that will surely go down as perhaps the greatest moment in USA Luge history. U.S. individual sliders had been fourth on three occasions at the Olympics, but never any better. So every four years, the same question gets asked — when will an American break through? Hamlin, a native of Remsen, N.Y., finally put an end to that. Hamlin finished 0.236 seconds behind Huefner in the race for silver, but held off Canada’s Alex Gough by 0.433 seconds for the final spot on the flower stand. It was the fifth Olympic medal for USA Luge, the first four — two silvers and two bronzes — coming in doubles races. When Hamlin crossed the line, that medal finally clinched, she threw her arms skyward, then covered her face briefly with her hands. U.S. coach Mark Grimmette — a doubles medalist for the Americans — raced over to offer congratulations, and men’s slider Chris Mazdzer reached down from the bleachers to hand Hamlin the U.S. flag. Then the roars kept coming, for the Germans. Maybe it was fitting that Geisenberger, Huefner and Hamlin were the three who found their way to the top. Every single time since 2007, in the year’s final race — either the world championships or the Olympics — one of those three women were crowned champion. And this marked the first time in Olympic women’s luge history that three world champions stood side by side on the medal podium. But there’s no doubt which one stands tallest these days, both literally and figuratively. Geisenberger turned 26 last week, already was a world champion and World Cup champion, and now has the Olympic title after taking the bronze in Vancouver four years ago. Much like Felix Loch, the men’s two-time Olympic champion and fellow protege of all-time great Georg Hackl, her run of dominance might just be getting started. How dominant was Geisenberger at the Sochi Olympics? Consider: The victory margins posted by the last four Olympic women’s winners, combined, was 0.949 seconds. Geisenberger’s lead after three runs this time was 1.049 seconds. And she didn’t take her foot off the gas for the final run, either. In other words, there was never a doubt. Kate Hansen of La Canada, Calif., was 10th for the U.S., and Summer Britcher of Glen Rock, Pa., placed 15th. They were both making their Olympic debuts. Geisenberger dominated the World Cup circuit this year with seven wins in eight starts, came to Sochi brimming with confidence, then simply made no mistakes. Geisenberger’s lead was just over three-quarters of a second after Monday’s first two heats, and she had confessed in the days leading up to the race that she was concerned about how she would handle sleeping with the lead. Given what she did to open things up Tuesday, it’s a safe guess she snoozed rather soundly. All she did in the opening run of the third heat was set a track record, a trip that took 49.765 seconds and took away any chance — there wasn’t much to begin with — that she would be getting caught. Gold was Germany’s again, the fifth straight time that’s happened and the 10th time in 14 Olympics overall. It also was the ninth time that German women, either unified or separated in the days the country was divided into east and west, won gold and silver. For them, Olympic hardware is a constant. And for the U.S., it’s no longer out of reach.